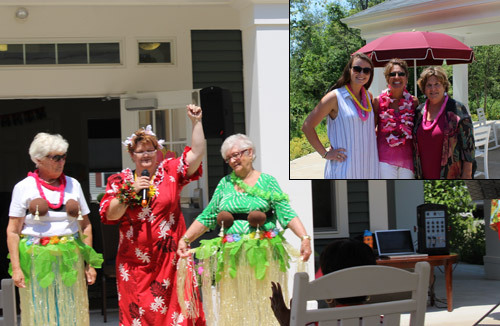 Marion, MA (July 15, 2016) – More than 25 residents of Little Neck Village – a community of 48 apartment homes located in Marion and managed by full-service real estate firm Peabody Properties, Inc. – recently celebrated the property’s 5th annual Summer Hawaiian Luau. Residents enjoyed traditional Hawaiian food and entertainment that included a sing along, limbo, drums and a resident dance contest. Pictured above (left to right): Resident’s Harriet Shaw and Jane Curry; Top right photo: Kaeleen Price, summer intern, Michele-DiTullio-Welch, Property Manager and Betsy Hagerty, Resident Services Coordinator. Real Estate Firm Peabody Properties Selected as Marketing and Management Agent for The Woodlands in MiddleboroughCalling Bedford Green Home!